ARTBA’s July 11 Engineering Issues breakfast at NASHTO. 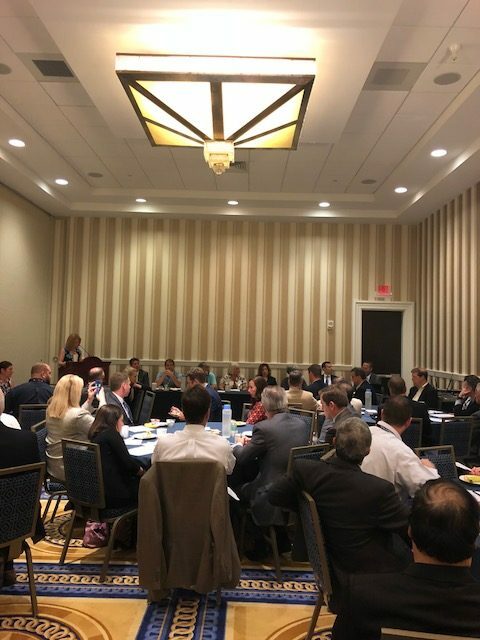 This year’s Engineering Issues breakfast at the Northeast Association of State Transportation Officials (NASTO) meeting in National Harbor, Maryland had nine state department of transportation executives on the panel. They represented agencies in New Jersey, New Hampshire, Delaware, Maryland, Pennsylvania, Vermont, Connecticut, Maine and the District of Columbia. The panelists discussed major topics, including alternative delivery, risk management, workforce development and new technologies. A consistent theme of their discussion was how new technologies are impacting safety, including the need for drones and safety cameras in work zones. “Every day we are thinking about ways to embrace technology to make our city safer,” said Jeff Marootian, director at the District Department of Transportation. Over 50 people attended the breakfast and a handout was provided that included detailed information on the various state transportation programs. For more details on upcoming ARTBA events at the AASHTO regional meetings and to receive a copy of the handout, please contact me.